Nearly 150 years after they were trapped and sheared in half by packs of Arctic ice, the ships from a long-lost whaling fleet have finally returned to human view. 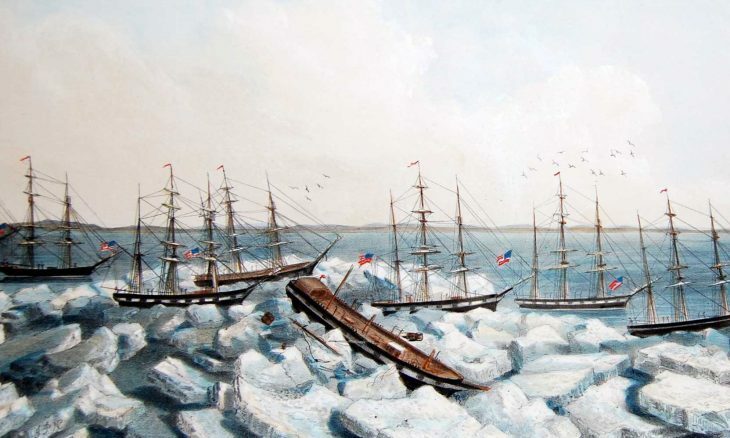 A total of 33 ships were shredded by ice off the shore of Alaska‘s North Slope in September 1871, stranding more than 1,200 crew members and their families in small, open whaleboats in the Chukchi Sea. Although the passengers were eventually saved, all of the expedition’s cargo of whale blubber, oil, and bones was lost, after the few surviving ships were forced to jettison their goods in order to make room for the stranded. The loss of the fleet made national headlines, totaling more than $25 million in today’s dollars — a debacle of such proportions that it’s said to have spelled the beginning of the end of commercial whaling in the United States. But today, in the same place and at the same time of year as when the whalers were waylaid by ice, government archaeologists have been able to access the site freely, thanks, they said, to global warming. Dwindling Arctic sea ice allowed researchers to survey the region of the wrecks this fall, surveying 50 kilometers [30 miles] of coastline between the towns of Wainwright and Point Franklin, Alaska. 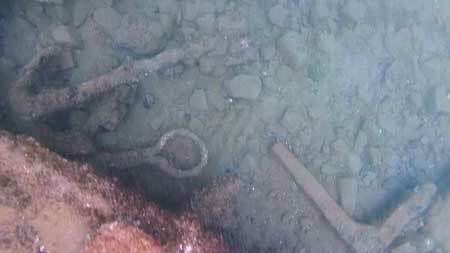 While earlier research had picked up some signs of the abandoned fleet on land — such as whaling gear that had been salvaged by the local Inupiat, and ships’ timbers scattered on the shore — this is the first archaeological evidence of the submerged wrecks themselves, scientists said. “Earlier research by a number of scholars suggested that some of the ships that were crushed and sunk might still be on the seabed,” said Brad Barr, archaeologist with the National Oceanic and Atmospheric Administration, in a press statement. The artifacts found among the shipwrecks include a variety of heavy equipment, such as brick-lined pots used to reduce whale blubber into oil, as well as anchors. These finds seem to confirm the theory that the ships were run into a sandbar about a hundred meters from shore and then ripped apart by approaching ice. “Usually, the Arctic does not destroy ships if there is a natural obstacle like a sand bar, large rocks, or a sheltered cove to partially divert the force of tons of ice,” observed James Delgado, maritime heritage director for NOAA’s Office of National Marine Sanctuaries. According to accounts at the time, the fleet originally entered Alaska‘s frigid coastal waters in August, searching for bowhead whales. The captains of the doomed vessels — including the George, Gayhead, and Concordia — expected easterly winds to pick up and move the sea ice that had been collecting in the area away from shore. 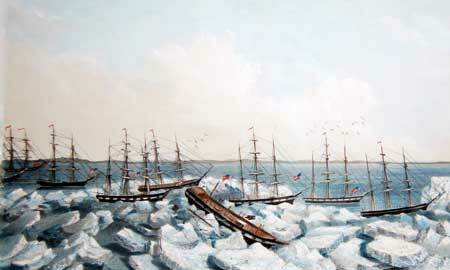 But the winds failed to arrive, and pack ice slowly encroached on the 33 ships, at first trapping them, and then gradually crushing many of them to pieces over the course of weeks. The ice ripped through the hulls, shearing off the tops of the ships and tumbling their timbers onto the shore, leaving the laden bottom halves jammed against the sandbar. Although it cost the expedition all of its takings to accommodate the passengers, the seven vessels dumped their catch, stopped their hunt, and sailed to Honolulu, Hawaii, to return the crew — many of whom were native Hawaiians — back home. In all, the archaeologists said, the discovery of the ships from the Whaling Disaster of 1871 not only demonstrates researchers’ abilities to piece together a nearly forgotten episode in one of America’s remotest regions, it’s also testament to the effects that climate change is having on our understanding of the history of the Arctic. It was ice free for the whaling vessels to reach that area. They got stranded in pack ice. Now there’s open water again allowing ships to reach that area. Stop using the false claims of global warming in stories. In the early 1900’s the glaciers in glacier bay were retreating 11 feet per day. Sea ice and glacial retreat are cyclic. Great comment, was about to write the same. It’s too bad we can’t read an article without climate change being thrown in. I wonder if its a way to justify the government grants. Wow……… and do you also think the use of machines is a threat to mankind…….and that all illnesses are airborn? Science of today must surely be questioned…… .but surely not denied? I can really see your questioning in action there Patrick…not. Can you question why satellite data shows no warming in almost twenty years, and how antarctic ice is at record levels, and would have crushed a global warming group’s vessel last year without other ships intervention?